What types of learning experiences do you seek/have you sought out? Do you feel they must relate directly to tapestry in some way? If not, why? Through the years, I have traveled many different learning paths since completing my formal education with a Master of Fine Arts. 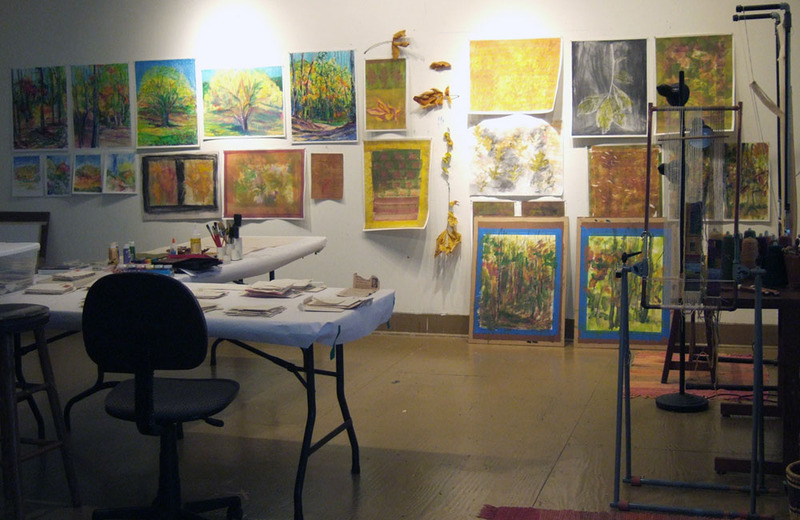 During my career as an instructor in the art department of a small university, continuing one’s education was an expectation on the way to tenure and promotion, but I welcomed the requirement since I enjoy learning. Taking short classes was necessary while I was employed full-time because the occasions for study were limited to breaks in the academic year. However, after leaving full-time teaching, I began to seek longer periods of study; I left behind the expected requirements for professional development and could at last indulge my desires to learn for the sake of learning. By that point, I was thoroughly hooked on tapestry making, and sought more occasions to study the medium. I have taken and continue to take many tapestry workshops. These opportunities open new technical avenues, yet also allow me to see old friends and make new ones in the tapestry world. Although tapestry is my primary means of expression, I am still curious about other methods of image making through weaving. For instance, the use of computer-assisted looms has become more available to individual artists, and I wanted to have a taste of the potential of digital and thread controller technology. When I learned that well-known designer/weaver, Bhakti Ziek was offering private tutorials at her studio in Vermont, I scheduled several days of study with her. 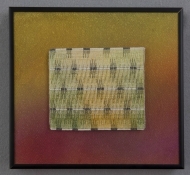 With her guidance, I developed a couple of my drawings into weave structures and wove them on her TC-1 computer jacquard loom. During my time with Bhakti, we had several lively discussions about how weavers in general who make images through all means have many commonalities. 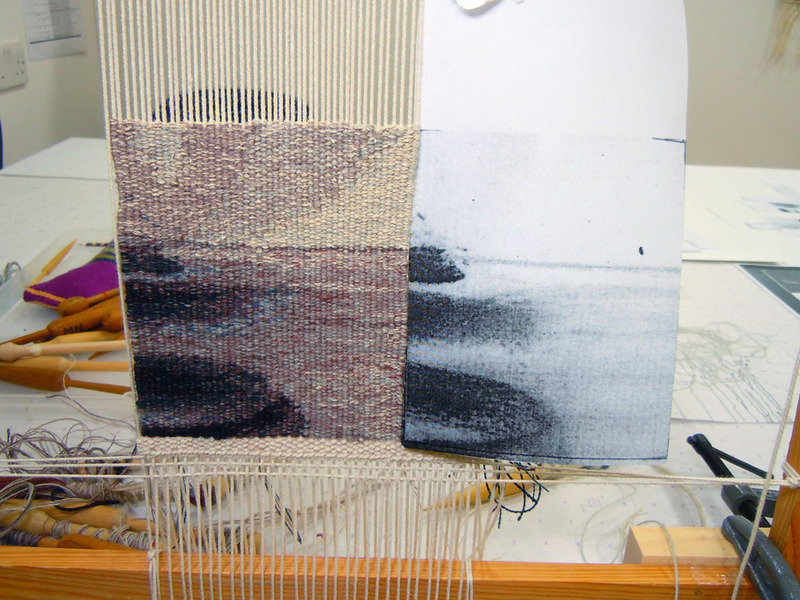 Yet, I have found that some tapestry weavers often question, disregard, or do not understand the processes used by other types of weavers who engage technology in their creative work. As a means to continue the discussion somewhat, I proposed this topic as part of a panel discussion convened by Mary Lane for ATA, during the 2010 Textile Society of America conference. My presentation examined the work of several textile artists who have used both tapestry and digital media for their image making. That paper, Woven Images: All Techniques Considered, can be read in its entirety here. I have also participated in writing workshops, attend a local writers group occasionally, and I maintain several blogs. 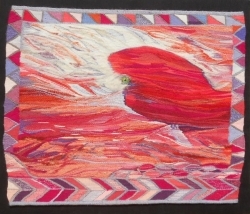 I use my blogs as ways to share about my work and about what I am discovering about tapestry. A private blog is a great way to interact with others; for instance, I have a private blog shared between my Distance Learning mentee and myself. While I certainly do not consider myself a “writer”, I have found these experiences to be helpful with my processing of ideas and information as I design for tapestry. Clarification of my thoughts is necessary while formulating the concepts for a tapestry and writing about the ideas in journals and for my blog is helpful. Mining the Vein of Creativity, an article I wrote about some of these ideas, was included in the Spring 2009 issue of Tapestry Topics. In 2010, I was able to pursue a long-held dream of studying tapestry at West Dean College in the UK. Tapestry was the focus during the six weeks I was there, but the required study of other subjects—drawing, printmaking, dyeing, and aesthetics—was an exciting challenge. Everything that I experienced while at West Dean met and exceeded my expectations. Engaging the services of individuals who specialize in working with artists and craftspeople for professional development has been another avenue in my self-designed course of study. 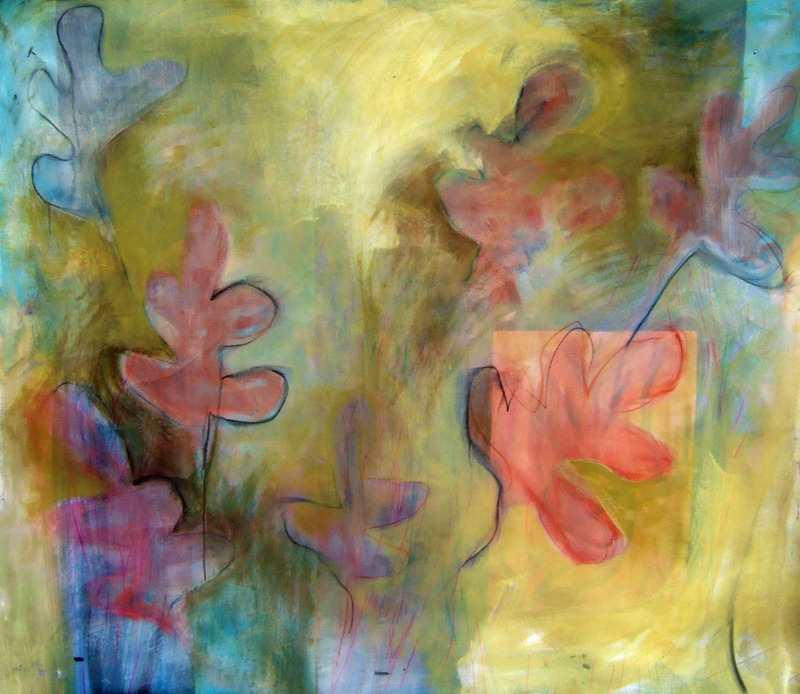 I have consulted with Steven Aimone, an artist, teacher, and author who offers private interviews to discuss both concept and design of one’s artwork; he has provided feedback about the design, compositional, and conceptual aspects of my work. I have also worked with Wendy Outland who, through her company WHO Knows Art, advises artists about professional matters, including portfolio development and business plans. I continue to keep in touch with the broader weaving field. Through those connections, I became one of the volunteer weavers working with Anne Wilson as she created her 2010 exhibition, Local Industry: Wind, Rewind, Weave at the Knoxville Museum of Art in Knoxville, Tennessee. 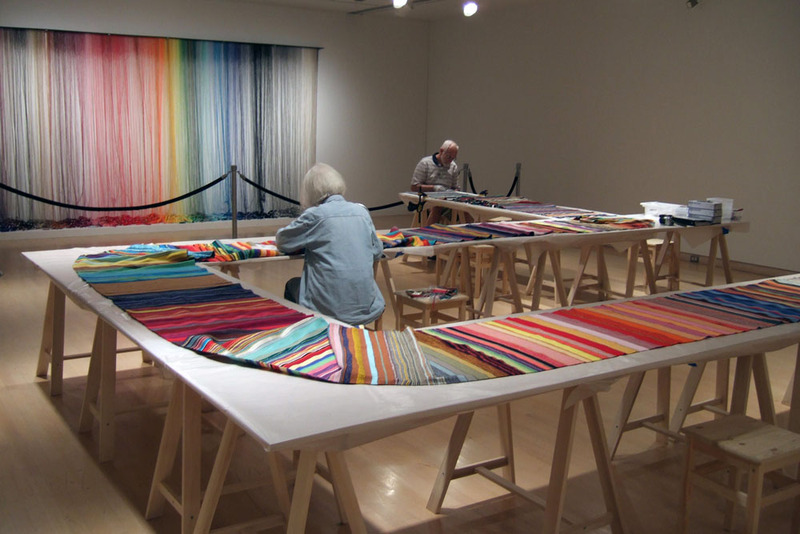 Wilson, artist and professor at the School of the Art Institute of Chicago, sought out weavers from around the U.S. to produce a length of cloth on a loom as a performance component of her exhibition. 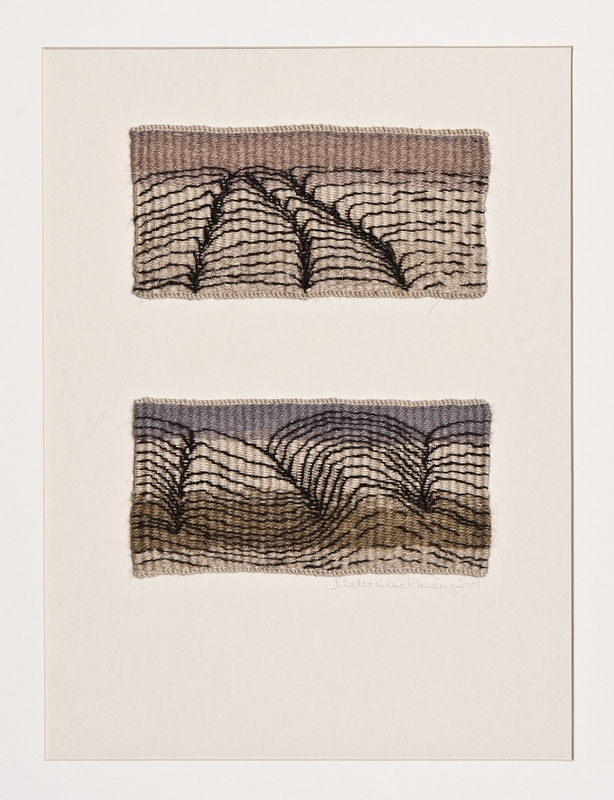 Becoming a small part in the larger scheme of Anne Wilson’s concept and exhibition gave me insight into ways that weaving can be contemplated in the wider art world. Other very important sources of inspiration for me have been trips taken to museums and galleries, visits to other artists’ studios where I gain insight by observing the working processes and spaces of others, and several artist residences I have been awarded through the years. For instance, when on a museum visit, I usually make quick sketches of either overall compositions that are interesting to me, or details seen in works. My interests lie mostly in pictorial works, whether those are ancient or contemporary. I also enjoy seeing textiles and am especially drawn to the works of Pre-Columbian tapestry makers. How do you feel those experiences have enhanced your tapestry weaving? Have any not and why? 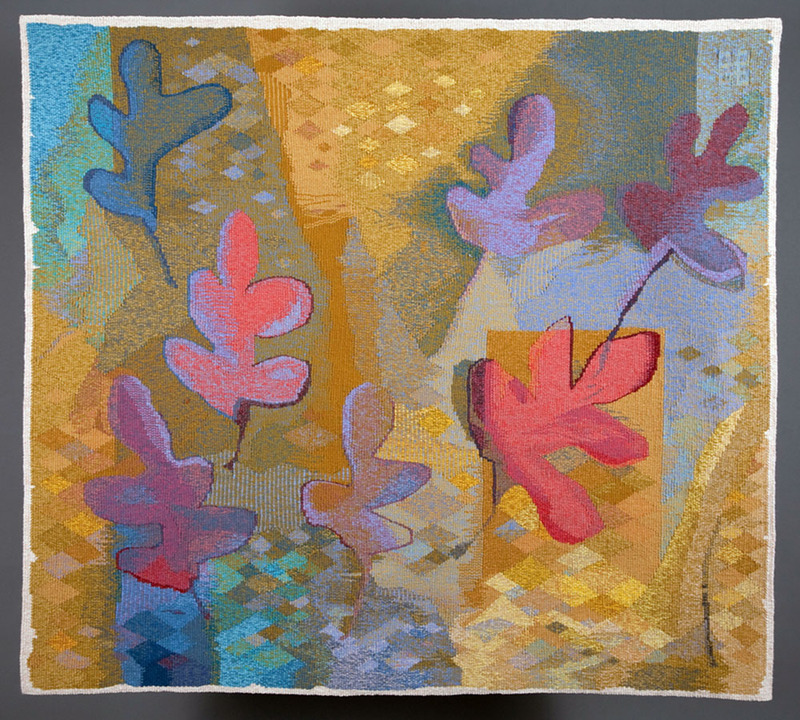 I often need a push to take me beyond my comfort zone for my tapestry work to move ahead. Periodically a stimulus, like a workshop, a consultation, or a retreat gives that push. Sometimes a subtle change happens, while at other times totally new directions might be presented. I have found that every experience can augment the artistic process. Learning, growing, seeking, finding… all of these can happen as one looks for occasions to push one’s boundaries. Are there any experiences that you have wanted to embrace, but have not yet? Are there any that you feel you could repeat many times and still benefit from? Occasionally, a couple of fiber artist friends and I get together at one of our studios for a critique session. However, I would like to be part of an ongoing critique group on a regular basis. Feedback from artists working in other media would be interesting and helpful; including tapestry as part of the discussion would expose others to the medium. Participating in a critique group with some of the faculty from the art department at the university is a future goal that I would like to pursue. ATA offers many opportunities for continuing education and I would like to take even more advantage of those than I have so far. I have been part of a few of the ATA forums and have found that these are a wonderful way to have ongoing conversations with others from around the world about various topics. Additionally, the ATA Distance Learning and Helping Hands programs are excellent resources; at one time, I served as the Distance Learning program coordinator and was a mentor. Through that involvement, I have seen how much growth can happen during the dialog that occurs in this program, for both mentor and mentee. I hope to find more ways to challenge my ideas for tapestry. For instance, I would like to gain a better understanding of the ways in which concepts can develop and enhance how they grow into tangible designs. Since I do not always know what particular experiences might lead to those challenges, I continue to keep my eyes open for anything that seems intriguing and that I can afford to take, both financially and time-wise. I definitely will continue to apply for artist residency opportunities. In fact, I am writing these words while sitting in a small cottage in the woods at Hambidge Center, on a short winter residency here. From where I sit, I can look up and see deep blue sky, with a filigree overlay of tree limbs. I see the low light of the morning highlighting the edges of the tree limbs and trunks. I have a loom with me at the retreat and I am weaving a small tapestry that has tree trunks as a main idea; seeing the trees before me informs me about how to proceed with the weaving. Can you identify any one non-tapestry learning experience that you feel has been the most beneficial or has had the greatest impact for your tapestry weaving? What made it so? 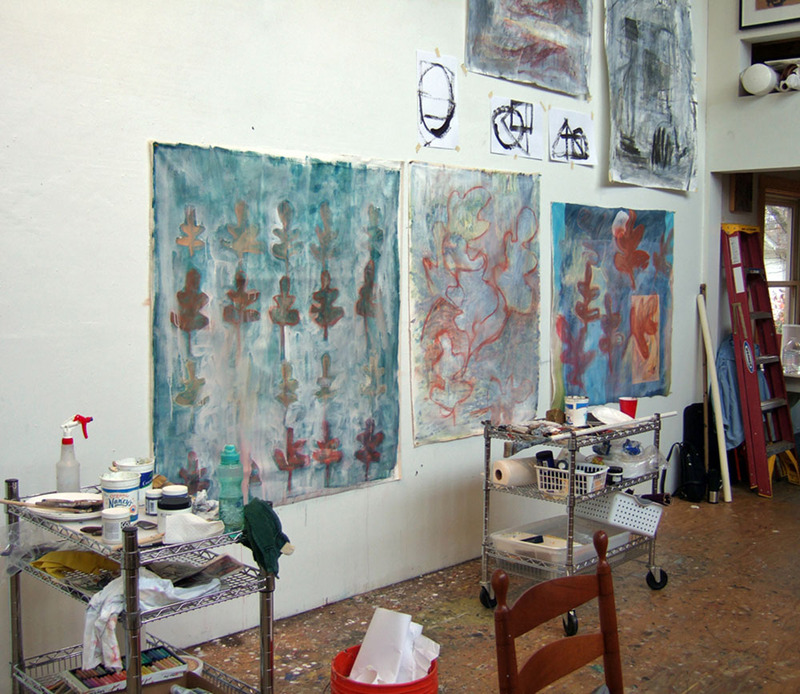 Without a doubt, the most impact on my artistic growth has come from residencies at artist retreat centers. Being away from the daily expectations of the “real world” in a beautiful and nurturing environment allows for reflection about ideas, as well as providing working space and time. Over the past two decades I have been a resident several times at the Hambidge Center and the Lillian E. Smith Center for Creative Arts, both located in the mountains of north Georgia. 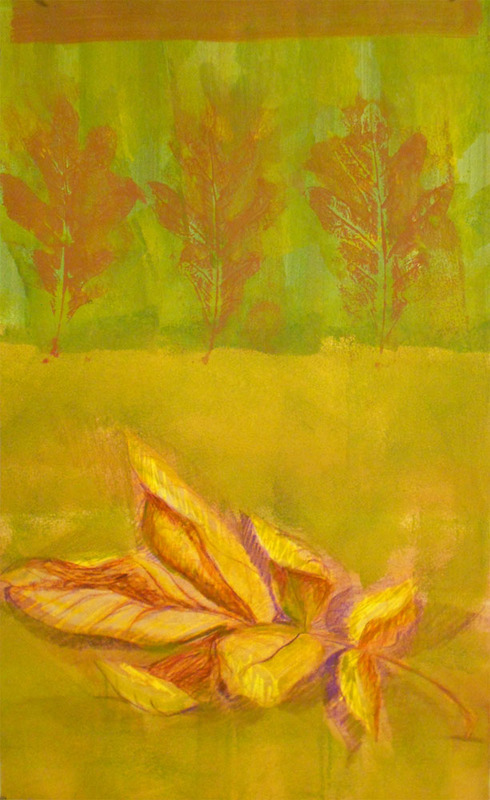 During each stay, I have developed a direction for a new body of work. The intense focus I can achieve in a few weeks away from home helps me form ideas and images that I can develop more fully in tapestry over time at my own studio. An artist residency is definitely a vital element for my personal creative growth. 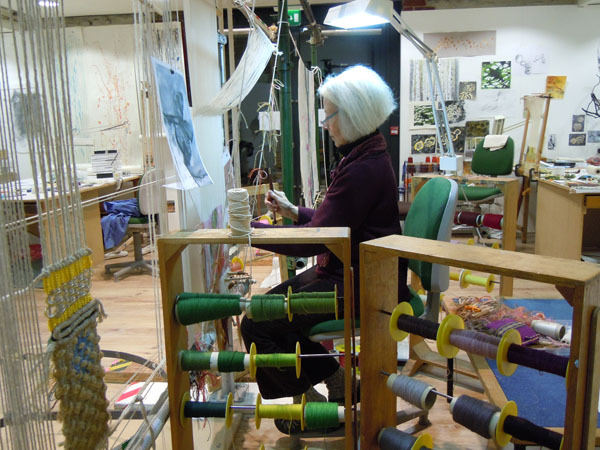 Have any of these experiences ever tempted you to leave tapestry weaving? Why? 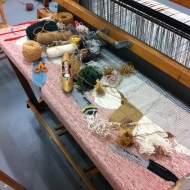 My continuing and varied experiences in workshops and during artist residencies have not tempted me to abandon tapestry. 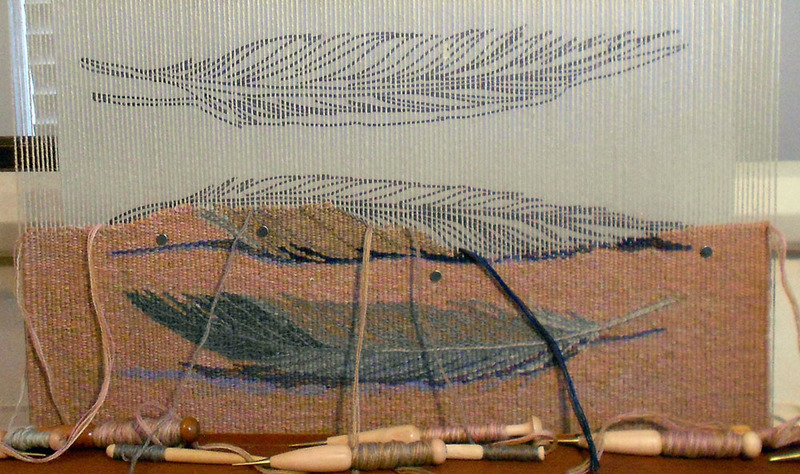 Maybe that is because it took me many years of doing other things in weaving before I turned to tapestry as my medium of choice. I constantly find that the building of image, pass by pass through the making of tapestry, is immensely satisfying to me. 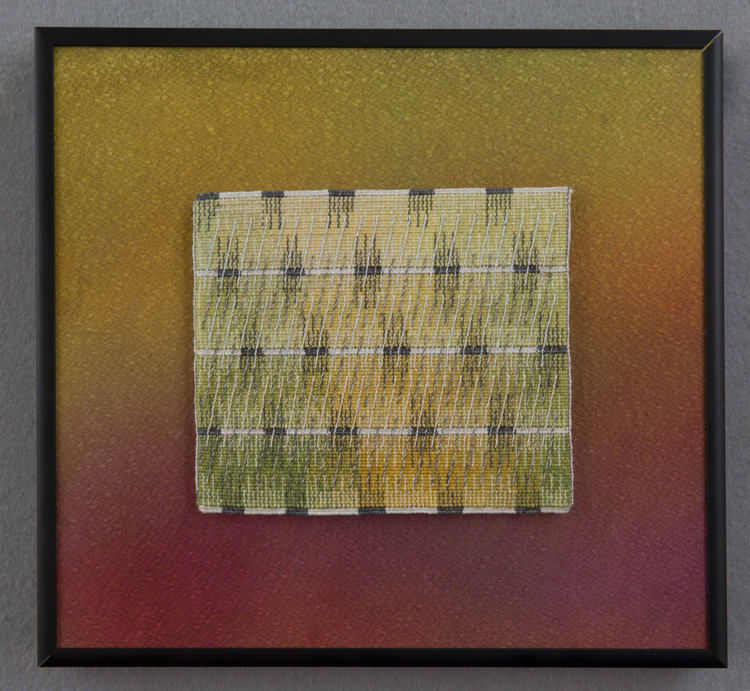 I both delight in and agonize through the challenges of finding and developing the images I want to weave, and executing them to the best of my ability in the seemingly simple—yet ever technically demanding medium of tapestry making. Do you feel that tapestry artists can truly maintain fresh perspectives and growth in their work if they do not regularly seek out these types of experiences? Why? I cannot speak for others as to whether their own work will thrive if they do not look for other experiences. However, I do feel that not “doing the work” will be what causes one to be dead in the water! A writer I met during one of my retreats at Hambidge Center talked about the need to “do the work” each and every day. That was the first time I had heard the expression but I understood what she meant immediately. 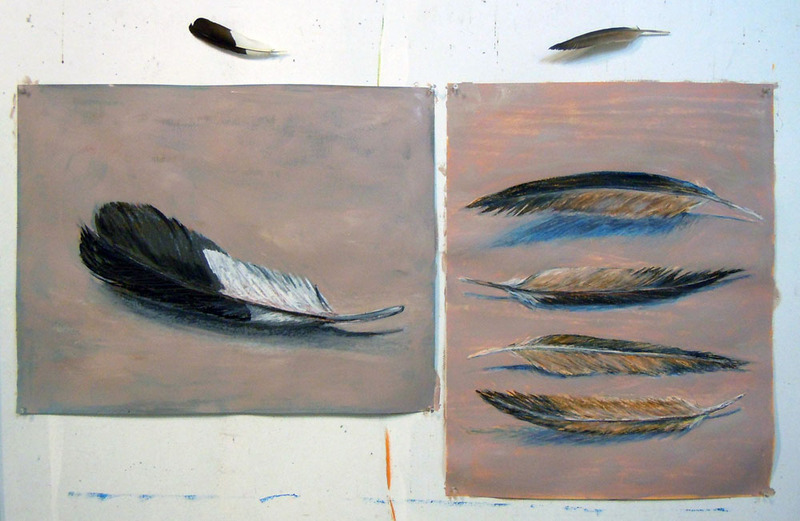 I find that it is critical in my own artistic practice that I make the daily effort. 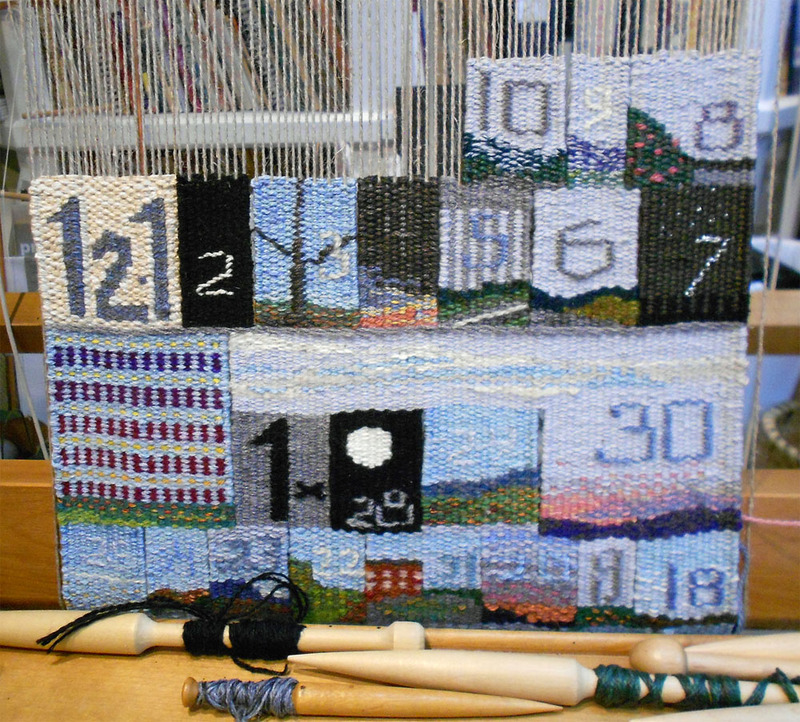 One way that I keep my hands engaged with tapestry making even when larger pieces are in designing or finishing stages is through my daily practice that I call my tapestry diary. I described this more in an article for the British Tapestry Group newsletter, Tapestry Weaver. The article can be seen on my blog in the post Threads of Time—One Day at A Time . 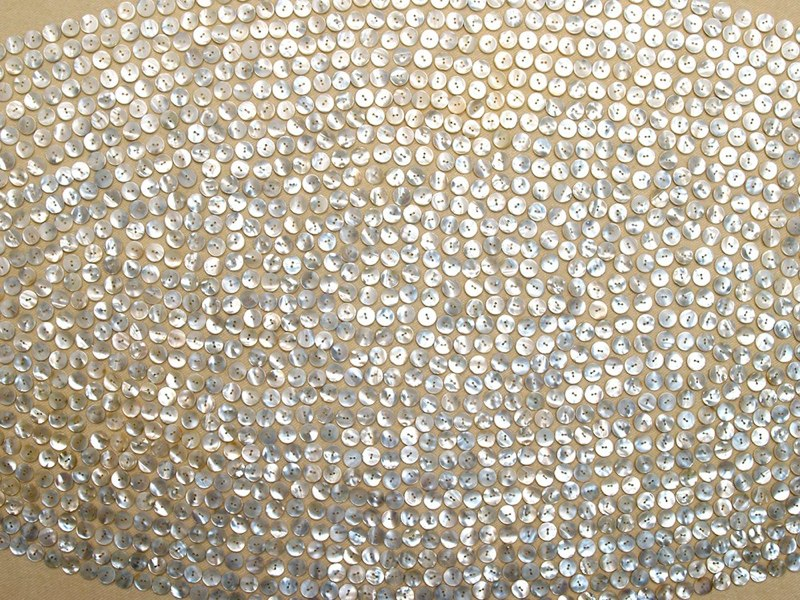 Sometimes, though, staying engaged means doing busy work in the studio because ideas are at a standstill. To make progress with my work I have to be in the work place. When I cannot be in the actual studio, a version of the studio travels with me. I always bring tools along… maybe sketchbooks, small looms, zip lock bags full of bobbins and yarns, drawing tools, camera, and a laptop. 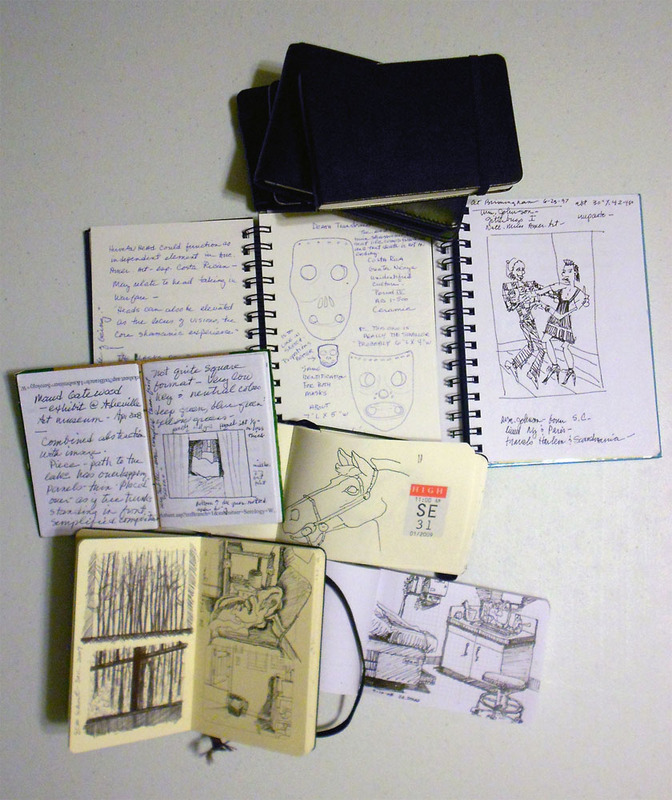 Having these implements at hand helps one develop the habit of visually recording ideas and observations. Even on trips to doctors’ offices, I have a small sketchbook, and in it are several pages of drawings made while waiting in the examination rooms. Will I ever make “real” artwork from those sketches? Probably not; yet, they are records of time and observation, both important to keeping the art brain active. 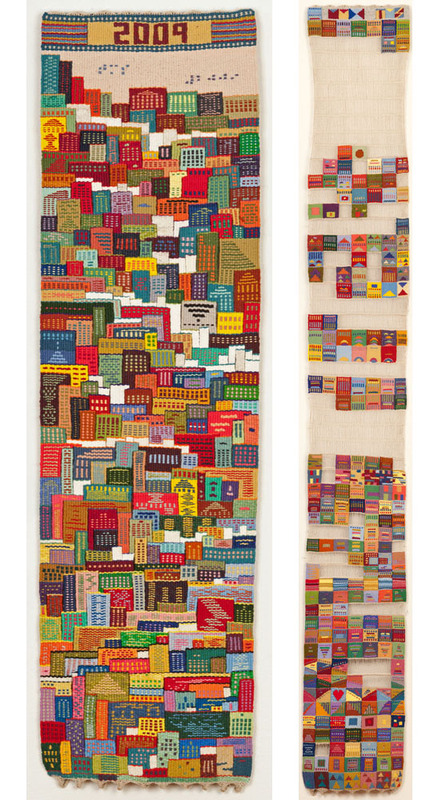 Workshops offered at fiber/textile art and ATA retreats and symposiums are mainly tapestry focused and taught by tapestry weavers… do you think we would benefit if alternative experiences lead by non-tapestry artists were offered? Yes, I feel that it would be very beneficial for ATA to offer workshops at retreats and symposia other than those with a tapestry-specific focus. 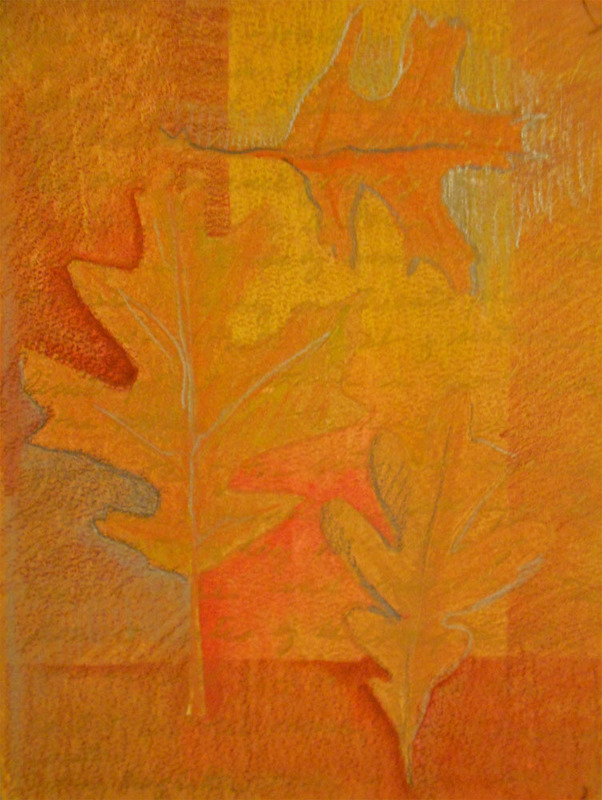 Some alternative topics might be: guided critique that could help one look beyond tapestry technique when analyzing one’s own tapestries and the work of others; instruction to hone drawing and design skills; or discussions with weavers who use other image making methods. Perhaps cross-pollination of ideas and techniques would enliven all of our weaving methods. For instance, Complex Weavers Association and ATA might schedule joint meeting places and times to encourage this kind of dialog. 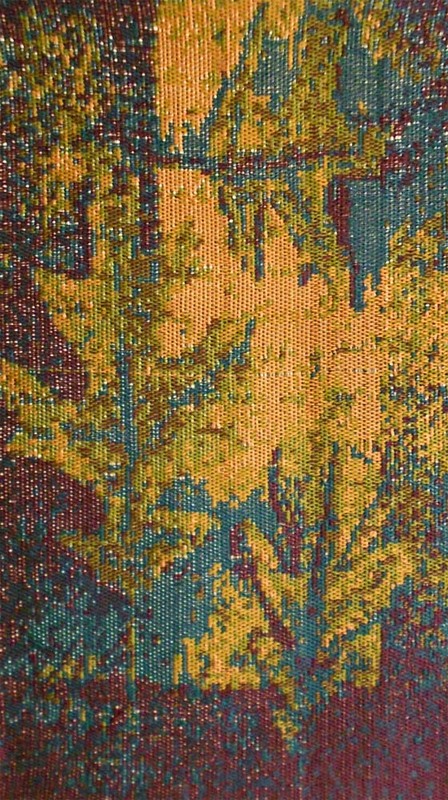 Textile Society of America symposia might also present opportunities for meetings between tapestry makers and other weavers. All of the activities I have described have been important to me over many years. 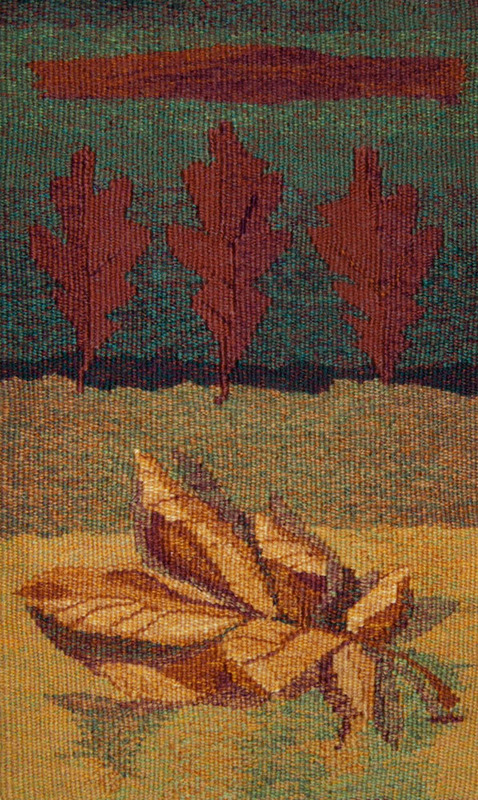 I encourage anyone to seek opportunities for learning about tapestry design and technique, but also to explore more widely. Yes, I admit that this can be quite expensive, both in time and in money. During my university career, I was occasionally fortunate to have a portion of workshop expenses reimbursed since those were considered part of my professional development. Early in my career when I first began to take workshops and funds were quite tight, I applied for and received a couple of small scholarships. Now that I’ve retired from the university, I frequently teach short classes and workshops; often the fee I earn from those goes right back into my next learning opportunity—supporting my habit, you could say. The kinds of experiences I have had are so important to me that I will find the way to pay for them and carve out the time for the opportunities.